A blend bottled in 2015 from the Fuji Gotemba Kirin distillery. 40% vol. Comments: On the nose it's unimpressive but the finish is pleasant. It's really named like that. 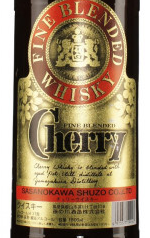 A blended whisky released by Suntory in 1998. 40% vol. The bottle has a fancy metallic cover. A fairly readily available whiksy in Europe. Bottled at 40% and priced in the entry level range. Comment: A very nice drinking whisky that would probably benefit from a few more vol. But generally well rounded. Here my review for the Kirin Oak Master. From my understanding this is a bottom shelf whisky. The bottle comes in various sizes with 40% vol. Nose: Glue, cherries, tree sap, sharp oak on the nose, but not too dominant. Mouth: Fresh, light, malty, a fair bit of young alcohol. A blend distilled in 1957 and bottled in 1967 - so it should be 10 years old. JBA stand for Japanese Bartenders Association. Again a simple mixer blend. 37% vol.